Why Has Kobo Stopped Selling the Kobo Aura One? Kobo’s sales and marketing techniques have always been rather unusual, especially when it comes to selling their ereaders in the US, and things just keep getting more perplexing all the time. 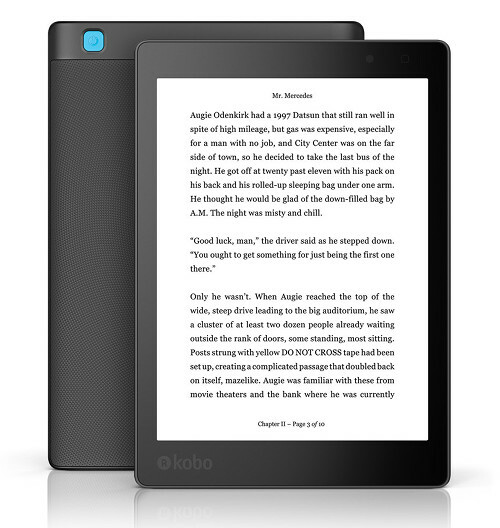 The Kobo Aura One was released 2 months ago. It’s the only ereader to have a 7.8-inch 300 ppi E Ink screen, which is my new favorite screen size. Lots of people are intrigued by the Kobo Aura One and want to buy it, but once again Kobo is making the process a major hassle. Kobo doesn’t sell their ereaders from any stores in the US so the only place to buy them in US dollars is from the Kobo website. The problem with that is Kobo has had the Aura One listed as Out-of-Stock for the majority of the time since its release. A couple of people left comments last week about the Kobo Aura One finally being in stock from the Kobo website but that ended up lasting all of about 1 hour before it was listed as out of stock again. Meanwhile, the Kobo Aura One has been in stock in stores and online from the Chapters.Indigo website nearly the entire time since it’s been released. In fact you can buy up to 2 of them at once. So why does Kobo continue to list it as out of stock from their website? Some people don’t want to order from a Canadian website in the US because it’s a hassle to exchange or return it if something is wrong with the device. From my experience, ordering from Indigo is a lot faster and cheaper than ordering from Kobo, but I can understand why some people would rather pay in US dollars and not have to deal with international shipping. Kobo has been making it difficult to buy their ereaders in the US ever since they started making them so I guess it shouldn’t be a surprise, but at some point you’d think they would figure out how to get things right considering they are owned by the biggest e-commerce company in Japan. Glad I pre-ordered mine — I love it! Guess I will have to look at Indigo for Christmas shopping. I had no idea that Kobo wasn’t keeping them in stock. Lucky you. But i did get one from ebay tonite. New and in box. Cant wait. I bet the comfort lighting is great. And the size to. Same in UK said they advertised reader and case in on 31st October then just gone to out of stock no date. I have Reader fron Argos UK which have them at present to collect over the counter but no cases. Unfortunately, it has NOT been in stock very often in Chapters bookstores. I went to the main downtown Chapters in Ottawa on release day at lunch, and it was already sold out. However the web page showed 10 units in stock for several days. Phoning around to several other stores showed the same thing. It took until about two weeks ago for local stores to receive stock again. The main downtown store sold out again that day, but I was lucky enough to pick one up that day. Despite whatever the Chapters website says I don’t think you can currently buy one in person. I noticed the “Out of Stock” listed on the Kobo website, and having been keen to get one I decided to try my local Australian store Angus and Robertson’s, They had told me a few weeks ago that although they were Kobo distributors in Australia they had never heard of the Kobo Aura One, anyway this time they had them in stock as well as the sleep cover. They despatched it immediately and I had it within three days. I don’t know how it compares pricewise with the Canadian or US price but it was $349.95 AUD plus $62.45 AUD for the cover. As far as i am concerned it is well worth the money and beats any of the many e readers that I currently own and use. Dam Kobo, i did have a pre-ordered Aura One i paid for it recieved it. Never opened the box i sent it back cause i thought it was to exspensive. What s dumbass i was. The more i looked at other ereaders, the more i realized how awesome the Kobo Uara One is. Then they ran out. I almost had one on Friday but right before i checked out it was no longer available. I did find the place in canada to order it from but didnt want to worry about extra shipping costs from there. I did find a new one on ebay the seller had 3 the next day it was at one so i got purchased it for a price of 285. 00 ya 55. 00 over retail, but i know this ebook is going to be awesome. This is the shortcut to UK stockist. If you want one they are still there. Perhaps Kobo is withholding sales while it fixes the battery software problem. They already fixed the battery drain issue with the last update. It fixed it for me and for many others. I think there’s a separate issue related to the sleepcover not shutting the Aura One off properly. It fixed a issue for me too. But I still have a problem, if my light is at auto the sleepcover doesn’t shut off the Aura One. Was this Kobo a first run test and they will be releasing a new and improved version? I really like the device. It has moved me away from Amazon. I love the larger size and color shift. I ordered from Kobo directly and received it from the mid October batch. I would definitely buy again. And recommend. Kobo’s U.S. distribution is absolutely infuriating. Basically, Americans have to book a flight to Canada to get one or take their chances on eBay where the transaction can be an adventure as to what you’ll get, when you’ll get it; if at all. That’s absurd. Yes no problem with battery now. Did a factory reset last Saturday, then let unit update itself to firmware and no draining at all.Update via software download did not go smoothly. Limited quantity back in stock. The Kobo Aura One is the worst Kobo ereader ever. I still have problems with battery drain,cover does not put unit to sleep and reading stats are a joke. I have been in touch with with customer care several times without any of the problems being resolved. Time to go back to Kindle I do think. I like the size and the lights, everything else like downloading library books is frustrating inconvenient and annoying. The battery lasts less than 2 days. It is very difficult to borrow library books, in Canada we can’t download library books to Kindle, or I never would have changed. I went to continue reading a book I had already started to read and my Kobo said “your eReader is not authorized to open this book” I had downloaded the book with ADE, now I have to download it again. To download books that I borrowed on my computer I have to tether the Aura One to my computer, which is a hassle if you are traveling. I purchased it 5 days ago from Chapters $249.00 Canadian.